The other day I talked about the history of the maximum tax levels. While its interesting to see how tax rates changed over the decades for people making incomes in the highest bracket that information doesn't apply to most of us. Most of us will never hit the highest tax bracket. Most of us make average income levels. For most people it is more relevant to see what tax bracket the median income level fell into. So for example today the median family income level is around $60,000 and at that income level your marginal tax bracket is 15%. By comparison 10 years ago if you were at the median level your family income would have been about $46,000 and your marginal rate would have been 28%. 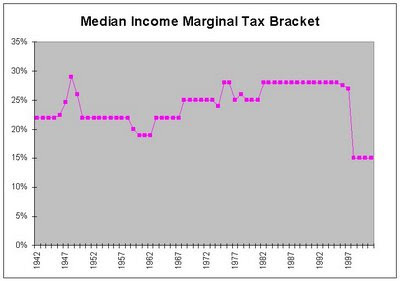 Historically the marginal tax rate has bounced around in the 20-28% range but right now people at median income levels are only at 15%. Historic tax rates are from the Tax Foundation. I used the family income levels from this census page.